In the original musical signal there are accumulated anomalies that deteriorate the sound. Intermodulation, asymmetry, interferences, electronic noise, alterations in the waveforms, non-sinusoidal, etc. These abnormalities are small, but once amplified severely restrain the electromagnetic behaviour of the speakers, and the the passive filters. The final sound is not as desired, producing a muddled and inaccurate soundstage, altered timbre, cancelling out micro-details, with a sensation of compressed or limited audio and heavy, exaggerated or slow bass . Neutral DREi is connected before the amplifier. Its analogue process helps with these abnormalities, giving a pure musical signal optimized for amplification and to be faithfully reproduced by dynamic speakers. It can achieve a detailed, pure, neutral and crystal clear sound, as well as music reproduction without listening fatigue. · 100% analogue, no digital process affects the audio signal. · Available for Professional and domestic High-End users. 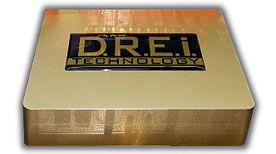 · Specially recommended for live sound and musical reproduction, being most advisable for large setups, where Neutral DREi demonstrates its full capacity due to the complexity of setups and many speakers. 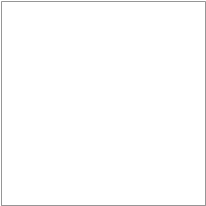 · Reduces artefacts and amplifies only musical content. 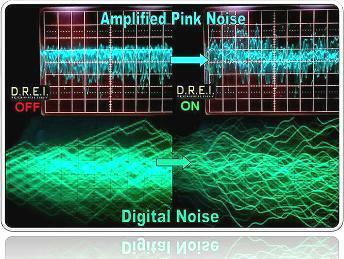 · Improves analogue signals coming from digital sources. · Easer mixing and helps with intermodulation. 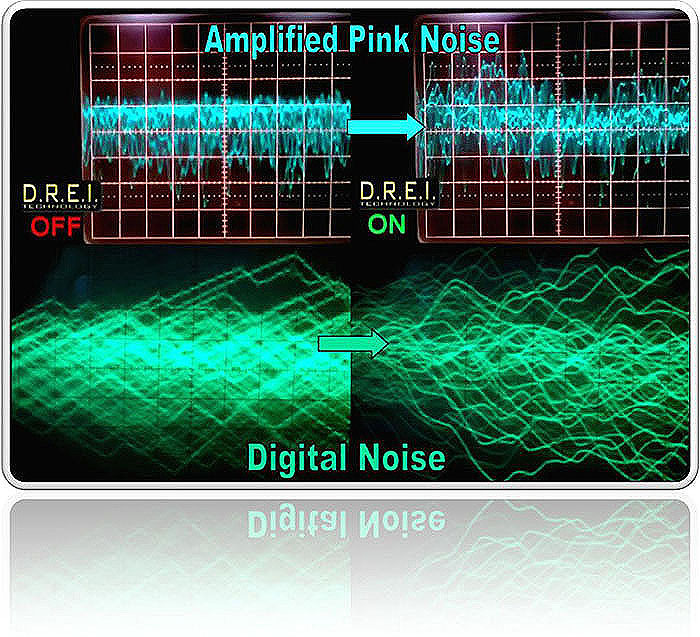 In this video you can check visually how a complex audio signal (digitally generated pink noise) behaves with a DREi module. Look the further definition of lines, the wide space between strokes , the complete symmetry of the output signal, rounding of non-sinusoidal waveforms. 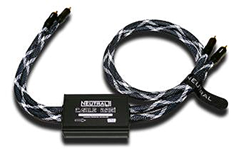 It improves speaker’s natural electro-mechanical behaviour. Daily, sound engineers and technicians work to reduce inevitable intermodulation produced in electronic components and between nearby frequencies. DREi can help with these sorts of intermodulation, making it a powerful tool for achieving optimal sound. You can observe in the image how it restores symmetry in the signal and, more over, the achieved definition is simply extraordinary. An ASYMETRIC signal passed through DREi and its completely SYMETRIC OUTPUT. The movement of the speaker cone will be electrically identical in both directions, using the energy from the amplified DREi signal, and not through its own mechanical suspension, slower and less precise . · Appearance of small details, now stronger an with unprecedented cadence. Try Neutral DREi for yourself or with live sound. You can verify it does what we say it does. A variety of designs for different customer uses. External processors, connection cables incorporated with our module and preamps. The intro series is powerful and effective, reduced size and power consumption, that allows us to use it in an affordable range of products, and in an small box attached to our connecting cables. The X series are much bigger, more effective and with a higher sound quality. They are included in our top designs, made regardless of cost. This link will take you to more videos with osciloscopes.